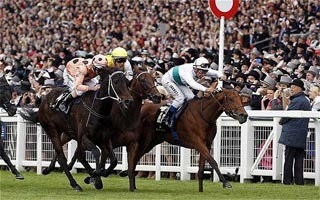 Society Rock won the Diamond Jubilee Stakes in 2011 but could only finish fifth behind Black Caviar 12 months ago. On that occasion he missed the break and forfeited several lengths before finishing strongly. He has proved himself one of the leading sprinters in Europe since then with victories at Haydock and York and is likely to go off clear favourite on Saturday. Australian horses have a fine record in this race and their hopes rest with the five-year-old filly Sea Siren. The John O’Shea-trained filly already has three group one victories to her credit and finished a fine second at Doomben at the end of last month. Ryan Moore has been booked to ride and there has been significant market support in recent days and she is now 8-1 with Bet365. Society Rock’s victory in the Duke Of York Stakes could be a good form guide to this race with the second, third and fourth horses set to reoppose. Gordon Lord Byron stayed on well into third and was also a close second to Society Rock at Haydock last season. His best form has been over seven furlongs so he is certain to be staying on strongly at the finish. Lethal Force put up easily the best performance of his career at York and will probably help to force the pace early on whilst Jim Goldie’s Hawkeyethenoo is proving to be a consistent performer at this level. The former Stewards’ Cup winner would probably appreciate a bit of rain before the weekend to take the sting out of the ground. Roger Charlton has decided to let Mince take her chance after two disappointing efforts. The stable struck earlier in the week with Al Kazeem and Mince has won on both previous visits to the Berkshire course. Trainer Edward Lynam enjoyed success with Sole Power in Tuesday’s King’s Stand Stakes and bids to complete the big sprint double with Slade Power. Maarek is another than cannot be ruled out despite a shock defeat at Cork last time out. Andrew Balding’s Zanetto and William Haggas’s Rosdhu Queen represent the three-year-olds. Haggas has taken the decision to stick to sprinting with Rosdhu Queen rather than step up to a mile and she could be a threat to her elders. Godolphin has had a quiet Royal meeting with the exception of Dawn Approach’s win in the St. James’s Palace Stakes. They are represented by Soul who was fourth last year whilst Aidan O’Brien relies on Reply, a beaten favourite at Leopardstown last week.